Bombardier Inc. is pleased to announce the appointment of Diane Giard to its Board of Directors, effective today. Ms. Giard is the Executive Vice President – Personal-Commercial Banking and Marketing of National Bank of Canada since March 2017. She joined National Bank of Canada in 2011 as Executive Vice President – Marketing and less than a year later became responsible for Personal & Commercial Banking. Ms. Giard has more than 30 years' experience in the banking industry, including several years at Scotiabank, which she joined in 1982 and where she held various executive positions. Diane Giard is a member of the Steering Committee for Montréal, Cultural Metropolis and of HEC Montréal's Conseil des gouverneurs. Since 2015, she has also been involved with L'effet A, an innovative project that aims to spark ambition in women. 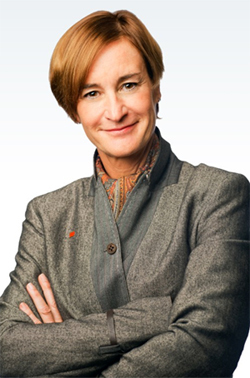 In 2008, Ms. Giard received the Prix Performance from UQAM's School of Management in the Manager category. Ms. Giard has also received the Queen Elizabeth II Diamond Jubilee Medal in recognition of her contribution to the community. She has been ranked among the Top 25 of Quebec's financial industry seven times, and was named one of Canada's Most Powerful Women: Top 100 by the Women's Executive Network in 2014 and 2015. Ms. Giard has a Bachelor's degree in Economics from the Université de Montréal and an MBA from UQAM. She is a Fellow of the Institute of Canadian Bankers.